Stock auctions are front-page news – for good reason, says PDQ CEO Don Ross: Computerized auctions have the potential to improve the efficiency and integrity of global stock markets. Stock auctions are front-page news – the feature piece in the March 15 edition of the Wall Street Journal, to be exact. My firm being a stock auctioneer itself, this is news to my heart. So what exactly is so interesting about stock auctions? The New York Stock Exchange runs only two of them a day, the first at the 9:30am opening and the second at the 4:00pm close. The latter, as the Journal piece makes clear, is a really big deal. More than $10 billion worth of shares change hands at this single point in time – that’s more than a quarter of the NYSE’s total average daily trading volume. And this percentage has been rising rapidly in recent years. What explains the closing auction’s popularity? The most important explanation is the rise of indexing. Index funds aim to mimic the performance of popular indexes, such as the S&P 500, the value of which is, for each trading day, set at the close. Naturally, the funds look to transact as much business as possible at that price. The NYSE has also been operating a government-granted monopoly on the close, which explains its 100 percent market share in the stocks it lists. Naturally, it is making corresponding monopoly profits: according to the Journal, nearly half the NYSE’s net revenue from stock trading comes from the fees collected on the closing auction. Naturally, as well, others are clamoring for a piece of this action. By far the most interesting aspect of the NYSE’s offering, however, is that big investors – even non-indexers – “like the closing auction because market liquidity,” in the Journal’s words, “is the greatest” there. “It is easier to trade large quantities of shares without pushing prices higher when buying or lower when selling.” In our words, liquidity attracts liquidity. Traders want to trade when and where others are trading because it means better prices. Now here’s where things get really interesting. The Journal piece doesn’t say so, but the NYSE actually ran nothing but auctions for the first 50-plus years of its formal existence, from 1817-1871. It only shifted to continuous trading – which is, of course, how most trading takes place today – because it became overwhelmed by having too many stocks to auction off. The exchange couldn’t get through all the auctions in a normal trading day. But it is more than curious that today, when advanced computer systems can process thousands of auctions per second, the NYSE still only runs one at the opening and one at the close. Or maybe it’s not so curious, given that firms like to operate where they have a monopoly – and in the case of the NYSE, that’s at the close. My firm, CODA Markets, in contrast, is a young firm, and the government hasn’t seen fit to hand us any monopolies. Maybe that’s part of the reason why we’ve set out to revolutionize auctions by holding them all day long – on demand. Though the wider market may not be wholly familiar with the concept yet, we are confident that the same forces driving institutional trading business to the NYSE close will eventually drive it to on-demand auctions. Why? Liquidity. Bringing buyers and sellers together, particularly big ones, at a single point in time means larger trades, minimum information leakage (traders don’t reveal their IDs or buy/sell intentions), better prices, and lower costs. 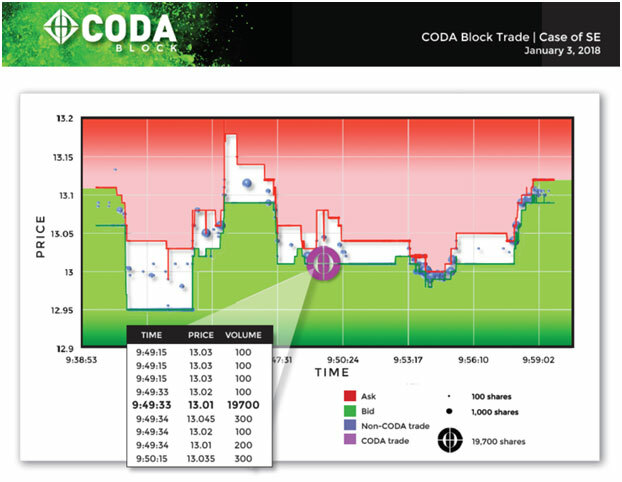 You can see the potential of mass participation in on-demand auctions in the graphic below, which illustrates an actual CODA Block trade executed one morning earlier this year. The firm that initiated this trade – the largest of the day for this stock – could, of course, have chopped its order into tiny pieces and fed it into the market over many hours or days, but experience suggests this would have resulted in information leakage, a worse net price, and higher costs. And the less liquid a stock generally is, the more benefit traders can expect from using auctions. This is why I’m so pleased to see the Journal drawing reader attention to the NYSE’s highly successful, though under-engineered, auction product. It illustrates a much bigger story than the Journal itself set out to tell – the story of why computerized auctions have the potential to improve the efficiency and integrity of global stock markets. ← Think Bitcoin’s Wild? Check Your Small Caps.